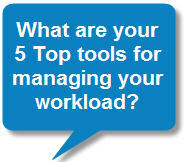 What Are Your 5 Top Web tools For Managing Your Workload? As part of my presentations on Personal Learning Networks (PLN) I created a PLN Yourself site to help new people work through setting up their own Personal Learning network. The site focuses on the top 5 tools for building your own PLN based on 196 responses in my Personal Learning Network (PLN) Survey. This site has been popular but is it catering adequately for people new to using web technologies? For those already engage in social networking we appreciate the value of building our PLN. But it must seem very foreign concept for new people? Perhaps tools that help them manage their workload or do it more effectively would increase their desire to learn how to use web technologies? So I’ve decided to build onto my PLN Yourself site by adding the 5 top tools for for managing your workload. Once again I would like to model how PLNs work. Results from this survey will be shared on this blog and used to determine which 5 tools to include on my PLN Yourself site. Another aspect I would like to add to my PLN information is when and/or who were the reasons why you started building your own personal learning network? Can you remember when you first started to use online tools and build your network? Was it a conference presentation, workshop, person or information you read online? Which people do you feel have influenced you the most to want to build your network? Can You Help Me Demonstrate Global Collaboration in the Web 2.0 World? Are You Being A More Effective Blogger By Tracking Comments? 1. Can you remember when you first started to use online tools and build your network? Yes, I did it originally when I first started Twitter a few years ago, but again more recently (I guess it’s actually over a year ago now!) as I’ve started a new job in eLearning. Both times I found it incredible natural, instinctive and easy. 2. Was it a conference presentation, workshop, person or information you read online? I listened to a techn podcast back in the day “Net at Night” with Amber McArther (Sp?) and Leo Leporte. My husband (we were just friends back then) and I would listen together, and even started out own little podcast where we researched cool new things on the internet etc. Twitter was one, as well as delicious, and things like that. 3. Which people do you feel have influenced you the most to want to build your network? I guess in my journey I’ve met some great people- Sue Waters, Julian Ridden, Chris Betcha, and others. They have all been helpful and supportive in my own personal learning journey- perhaps without even knowing it. Because I met these great people I’ve wanted to meet more great people and extend my network and be a ‘great person’ myself. Thanks Talia for sharing your story. I’m really interested in what made people decide to become engage. Looks like I’m probably going to have to rewrite the post with just the questions because I think people are just jumping across to the survey – oh the fun of blogging. I started using listserv’s about 3 years ago, and went from there. About 8 months ago I started writing my blog, and really started working on Twitter. I’ve been on a NING for about 10 months. Mostly it was information online. All the bloggers I have been reading really helped me decide to get started on a PLN. Twitter has really helped me expand my network. Thanks Patrick for sharing your story and for telling your readers about it. It is interesting to learn about how different people have become involved in using technologies. Saw your comment on Wes Fryer’s site about WordPress V. Edublogs and have to admit I was a bit shocked. Why on earth would the education side be less secure than the public side? Maybe I just missed it someplace and made some assumptions based on WordPress so I will make sure to correct my facts, but I have to admit it also makes me less likely to recommend Edublogs to teachers and tech coordinators. Has this always been the case or is it a change? Does it say anything about this on the Edublogs site? Thanks for any clarification you can give. Thanks for the comment and I’m just posting the contents of the email I sent to you so that others know my response to your comment. When I saw the statement on Wes’s post I wasn’t sure if he had misinterpreted what you had said or if that is what you had said which is why I wrote my response on his post not yours. Edublogs would not allow these embed codes if there was any risk to our database or its users. We have too many users to take any risk and I’m not just talking about standard Edublogs users I’m also referring to Edublogs Campus users that include very large Universities such as Cornell Universities. There is absolutely not way any of these large Universities would allow this is they consider it a risk to their networks. Allowing the embed codes means that users can embed almost any code within an Edublogs blog. I frequently have readers of The Edublogger who are WordPress.com users try to embed the same objects and can’t because of their restrictions on embed code. Many of these that we can embed are valuable tools to use with our students. 1995: I was 13 years old, in yr8, and watched with breathless anticipation as someone from our ISP made a house call and set up our computer, modem, etc. for us. It took 2.5hrs and we had a top (potential) speed of 14.4kbs! I was hooked on Internet Relay Chat (IRC) early on and used it to chat with people in the US and in Perth. I started #Perth on Austnet and soon we were averaging hundreds of simultaneous chatters with a peak in the 700’s about 3yrs later. We had regular ‘net meets, and the joke used to be that if you saw a group of people wearing black hanging around Perth train station, it was probably #Perth. IRC was a great way to study for yr11/12 exams, but as I went through university, more and more of my IRC pals drifted off to the blogosphere. IRC also lost its appeal as VOIP and graphical interfaces became more popular, and the amount of “a/s/l” increased on IRC. I moved away too – LiveJournal became the “hub” of my network. That said, 14yrs after logging on for the first time, I’m still friends with those people I was chatting with on IRC in the early days and they are still a part of my “network”. Teachers and Graduate Teacher blogs (e.g. community.livejournal.com/teaching and a variety of RSS feeds). Because I’m not teaching at the moment I find their posts are the best way to keep up-to-date with the realities of the classroom rather than (only) what I read in academic papers, and I like “hearing” about experiences in other countries. Penny, I can’t even remember when we connected the Internet at home but I can remember muttering about whether the expense was worth it just as I did the same upgrading to broadband. Funny how you can agonize over those decisions. Now I couldn’t imagine life without. But it’s funny… I still can’t justify getting Foxtel! I think it was almost from the moment i began using the internet – 1996 – I was accessing via a shell account using Lynx as my browser… IRC was order of the day and PINE was handling my email. I started building community almost immediately. By 1997 I had gone GUI and Netscape was my favourite browser. I started a site for Drama teachers to connect from around the world and began a mailing list shortly afterwards… I also became active in Geocities and helped as banner builder… I have a collection of hundreds that I made at that time. It is funny how we move through that process of someone needing to guide each step to that point as you say of “no longer needed teachers”. How important do you feel those mentors were in your initial development? So I have to know! What did you decide? iGoogle? Netvibes or something else?